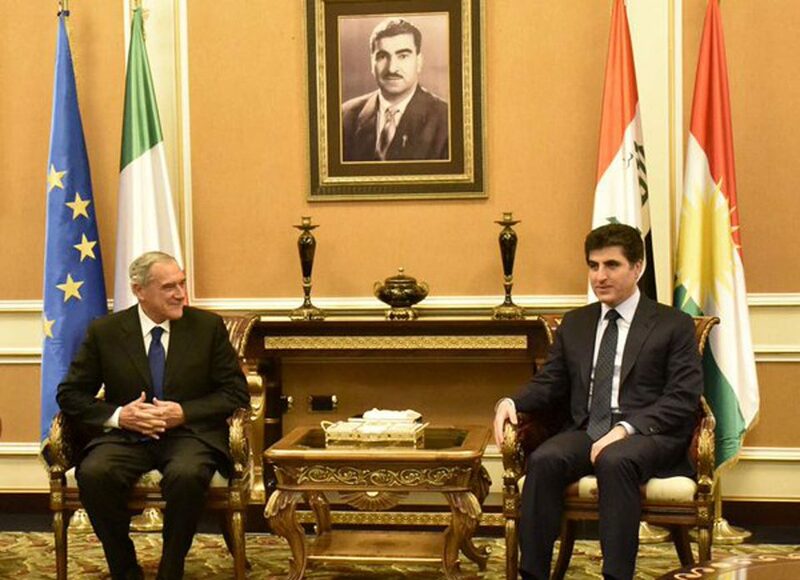 Today, The President of the Senate Piero Grasso, accompanied by the Italian Ambassador in Baghdad, Amb. Marco Carnelos and the rest of the Italian delegation, composed of the Adviser for International Affairs of the Pres. Grasso, Dr. Rosario Salvatore Aitala, the Spokesperson of the President , Dr. Alessandro Pasquini, by dr. Claudio Tosi, by the military attaché, Col. Alfonso Manfredi, landed at Erbil International Airport. To welcome the President Grasso the Prime Minister, Nechirvan Barzani, the Head of the Protocol Office, Sherzad Azad, the spokesperson of the Prime Minister, Dr. Safeen Dizayee, the Head of the Department of Foreign Relations, Min. Falah Mustafa, the High Representative of the Kurdistan Regional Government in Italy, Mrs. Rezan Kader, the appointed Italian Consul in Erbil, Dr. Alessandra Di Pippo. The President Grasso will attend the inauguration of Italian Consulate in Erbil and will participate in a welcome dinner at the invitation of Prime Minister Barzani. The day after, on December 23, he will meet with the President of the Region Masoud Barzani, he will visit to the camp for displaced persons in Ainkawa and the Italian military training center, where he will meet the Italian commander.